Mark’s introduction to RVs began in 1975 when he got a job washing RVs where his friend’s dad was the GM of a dealership. With his interest in all things mechanical he soon landed in the service department, working as an apprentice RV technician. His career in the RV industry was put on hold temporarily when he joined the U.S. Army in 1978. His military career started as a wheeled vehicle & power generation mechanic and culminated as an Automotive Maintenance Chief Warrant Officer 3 in charge of large fleet maintenance operations. 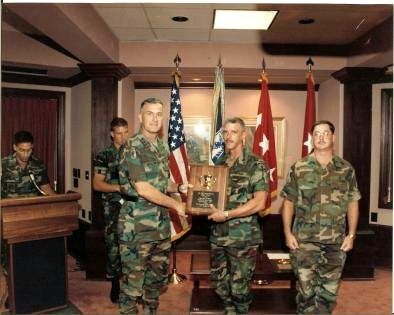 Mark completed airborne training in 1979 and served with some of the most elite U.S. Army Airborne units, including Service Company 7th Special Forces Group (Airborne), 82nd Signal battalion, 82nd Airborne Division and the 16th Military Police Brigade, XVIII Airborne Corps. It's funny how some of the smallest ideas turn into the biggest projects. That's how RV Education 101 was founded. 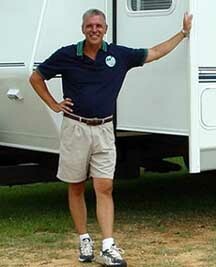 Mark Polk was working as a sales manager for an RV dealership in North Carolina in the late 1990s. The company took pride in guiding customers through a thorough walk-thru presentation on the RV they had just purchased. Staff members would explain how every system worked, how every appliance operated -- two or three times, if necessary. They would explain the order in which things had to happen before something could work correctly. They would go through the location of critical switches and controls. By the time they were done a hour or so later, the beaming and confident RVers were chomping at the bit to take their new toy out for a weekend spin. Without fail, the dealership would get one call, then another, and still another as the enthusiasm gave way to confusion. "Where is the circuit box," they'd ask one time. "My slide out won't slide out," they'd ask a few hours later. "What was it you were supposed to do before you could turn on the air conditioner," they'd ask on the third call. “How come I don’t have any hot water,” the exasperated RVers would exclaim. As much as Polk and the rest of his staff loved helping customers and wanted them to be comfortable with their new purchase, he realized the walk-thru orientations were mind-numbing to new RV owners simply because it was information overload. It was as though the staff had to give two or three walk-thrus with every purchase, plus answer dozens of phone calls before, during and after each of the first few excursions the buyers planned. "As the sales manager, I came up with the idea of finding a video that we could give to customers as a courtesy gift from the dealership reminding them how to operate their system," Polk explained. Face it, when you look at a folding camping trailer, there aren't too many things that are different from model to model. 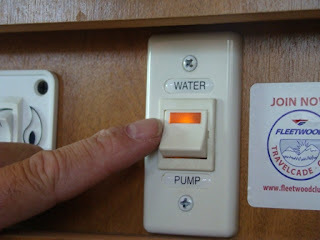 Even with travel trailers and motorhomes, they all have water pumps, they all have refrigerators, water heaters and most have one or more slide outs. One thing is for certain, every RV has waste tanks that must to be dumped in the same manner -- connect this hose from Point A to Point B. Empty the black tank first, then the gray tank. "I looked everywhere and could not find a single basic instructional video on how to operate an RV," said Polk. "I was shocked. There was nothing on the market." So, he stepped up to do it himself. Polk had worked in the RV industry since he was 15 years old washing RVs for the father of a high school friend who owned a dealership. That summer, when he wasn't washing something, he was hanging out in the service department where he became fascinated with all the intricacies of motorhomes and travel trailers. The service manager took Polk under his wing and he started working as an apprentice technician. "I really enjoyed working around RVs and going to rallies to help perform basic service on customers’ units," he explained. "You could say I was bit by the RV bug early on." His maintenance plans were interrupted when he enlisted in the military. But, he liked that too and spent the next 18 years with the U.S. Army eventually retiring as a maintenance chief warrant officer 3.
was awarded a first place maintenance award from General Shelton. But, the moment he left the military, he was back in the RV industry working as a salesperson for AllSport RV Center in Fayetteville, N.C. Two years later he was offered the sales manager position and he eventually took over as the finance and insurance manager as well. He was well grounded in the RV industry and intimately familiar with just about every make and model of RVs on the market. It was in 1999 that he became frustrated with the lack of consumer educational materials and safety awareness information. 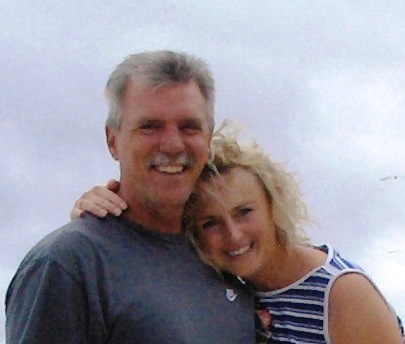 One day, he shared his frustration with his wife, Dawn, who also worked at the dealership. After suggesting he wanted to film a simple walk-thru style video Dawn rounded up a few friends she knew who worked for a local TV station and did their own video filming and editing projects on the side. They hired the film crew to make the first walk-thru video for travel trailers -- the most popular RV the dealership sold. "They filmed me as I basically completed a walk-thru orientation, capturing close-ups as I pushed buttons and pulled levers," Polk explained. "We put the video into use at our dealership and I tried to market it to other dealers and consumers in the area. The idea took off quickly enough that he could retire from the dealership in 2000 and pursue the business opportunity full time with Dawn at his side. The Polks enjoy a great partnership. Mark handles the training portion of the business by producing videos, writing scripts, overseeing filming and doing all the video editing himself. Dawn works behind-the-scenes overseeing order fulfillment, accounting and marketing. Once he left the dealership, Polk pursued his own education by taking online courses offered by a community college in Florida. He's not a master certified technician because to get the title, he would have to work at the direction of another certified technician -- and he's not planning on going to work for someone else any time soon. But, he certainly knows plenty about RVs of every brand, model, shape and size. He's also intimately familiar with the components on those units, whether it is an air conditioner, RV refrigerator, furnace or generator. Eventually, he also filmed a walk-thru of a Class A motorhome, then a pop-up trailer,then a Class C motorhome. Pretty soon, they had a set of four videos and figured they had every aspect of the RV industry covered. Then people started expressing interest in specialized training, like how to winterize their RV or tow a car safely behind a motorhome. Within 10 years, Polk had completed 17 different titles -- and wrote “The RV Book,” a basic instructional guide people could keep in the drawer of their RV and refer to it whenever necessary. "These are simple-to-understand videos," Polk explained. "Consumers can watch one and be comfortable in changing the oil and filter on their generator, but they aren't going to learn how to replace major components and diagnose problems with electrical output." The material started appearing on shelves at RV dealerships across the country. But the really big break came when Wal-mart noticed the company. Actually, the Polks pursued Wal-mart’s corporate buyers for nearly four years until the company agreed to add three DVDs and the book to their inventory. "At the time, Wal-mart was aggressively promoting an RV section in many of their superstores where they had a dedicated section of basic RV related products, and our materials were a good fit for that market," said Polk. The Polks sold so many videos and books during the two and a half years Wal-mart carried the product line that they quickly owned the market for RV educational products. Eventually, as the recession unfolded, Wal-mart discontinued carrying the product in stores and opted to focus more on consumable goods. But, by then, RV Educational 101 had a strong national market and even stronger name recognition. About the same time, the Polks realized technology was changing in a way that made it possible for them to take their entire training library and put the information online. The entire world was "going digital" and they wanted to lead the way. "We decided it was time to come up with an online training program where people could learn about their RVs without having to travel somewhere with their RV to get that training," Polk explained. They developed RV Online Training, a choice of video or E-book self-paced training module. People who complete the video programs receive a certificate of recognition. "Our RV 101 online training program is reputable, thorough, easy to understand, self paced and affordable.," Polk explained. "Our training is easy to understand and takes you step by step through the valuable information." he added. The training is very simple to follow. One of the topics, for example, focuses on RV water systems. It features a video and included are a few short articles people can read that elaborate on key points for better understanding. Users can hone their skills by completing a crossword puzzle before taking a quiz. The new digital age allowed RV Education 101 to grow even faster as more and more customers discovered the convenience of receiving quality training from the comfort of their living room. Now the Polks are looking at hiring staff to help run the business and they moved thousands of DVDs and videos out of their home office to a fulfillment company in Charlotte that sends out large order to dealers and handles replication of the product. But, the couple hasn't lost touch with RVers. Whenever a single RV or book is purchased, it is likely Dawn who is sealing the envelope. In fact, at the time of this writing, the Polk's along with their son Tyler are looking forward to spending five weeks this summer on the road taking a cross-country RV trip to Washington State. "We'll pack up a cross section of the inventory and a stack of envelopes and spend the first hour of every day shipping out orders and communicating with customers," Polk explained. He admits to being surprised at the reluctance of many RV dealerships to embrace the product line. Of course Polk sells books and online videos to hundreds of dealerships who share his vision of providing quality basic education to new RV owners. But, there are thousands of other dealerships who don't see a need to carry the book and online videos. That's especially puzzling considering the heavy consumer demand for the product as evidenced by the firm's exploding online sales among first-time RV buyers. "Early on, I was told our material was too generic, but that's exactly what people need to know when they are buying their first RV," Polk said. "In their house, to get hot water, people need only turn on a faucet and it 'just happens.' But, in an RV, there are several steps people need to take to ensure a nice hot shower -- and helping people understand those steps is what our product is all about." "We are very proud of our company and the quality of training products we produce," Polk said. "Both Dawn and I like knowing that we are playing a part in helping families enjoy their RV experience a little more by knowing how to use their equipment properly. That allows them to spend more time relaxing and less time trying to figure out how things work."